The connections between and machinations of these people, including some of the student protestor's own parents, is what is being examined here. This wave of protest, well-funded and carefully stage managed, is fostered not by the grassroots organizing talent of teenagers, but by a network billionaires, bankers, Centrist Democratic Party politicians, Police Chiefs, retired military officers and intelligence community professionals. The right wing press was quick to point out David Hogg's father is a retired FBI agent. This is the least significant fact in the situation. The only misstep more foolish in this public debate is their tendency to gravitate towards criticizing Emma Gonzalez's hair style and bashing her sexuality. When they do that, they ignore her father, and some of their “investigators” have actually gone so far to claim he is a cocaine addicted child molester in Dallas. In truth, her father is a wealthy and powerful man. Jose E. Gonzalez is much more than a simple “cyber-security lawyer” in New York. He is a top level cyber-security financier who formerly had a direct line to the Obama White House. We will examine his history and connections later in this article. The constellation of non-profit advocacy groups that form the uplifting pillars of March for our Lives includes a number of billionaires. A $1 million dollar donation from Oprah might seem like a great deal of money grouped together with money from George Clooney, but Oprah-as-celebrity is not Oprah-as-billionaire. Her net worth of $2 Billion makes her the third poorest Billionaire involved. The list includes Warren Buffet ($84.2 Billion), Michael Bloomberg ($51.1 Billion), Eli Board ($7.3 Billion) Ken Lerer (Chairman of Buzzfeed and Huffington Post) Irwin Jacobs (CEO of Qualcomm) and the poorest billionaire Nick Hanauer ($1 billion) who worries about the poor coming with “pitchforks” for he and his "fellow .01%ers." Although involved in the network of non-profits, Morgan Stanley CEO John Mack does not qualify for the billionaire’s club. When one considers the media power brought by Lerer's Huffington Post and Buzzfeed alongside Oprah and Bloomberg's media holdings it is little wonder that the Parkland teens have such a big media footprint. The optics of your pet protestors are great when you own the cameras and the handlers. How many politicians does a combined personal fortune in excess of $150 billion buy? Well not counting former New York Mayor Michael Bloomberg himself, quite a few. Bloomberg, far from being against gun violence in black and brown communities as Mayor, advocated the stop and frisk policies that made New York the bastion of repression and police brutality lawsuits it remains today. Bloomberg is joined on these non-profit boards by former Columbus Ohio Mayor Michael Coleman (Columbus is number #1 in police shootings of black men per capital in the US. ), Philadelphia Mayor Michael Nutter (who as council member hired John Timmoney to crack heads at the 2000 RNC), Miami-Dade Mayor Carlos Giménez (who worked as fire chief alongside John Timmoney to crack heads at the 2003 FTAA protests), Milwaukee Mayor Tom Barrett (Milwaukee saw riots in 2016 which in response to police violence which the Chief later blamed on “communists” who were “preaching revolution”), and former Houston Mayor Anise Parker (Houston leads the nation in the number of death sentences handed down). These people are not against violence unarmed children, as long as the gunfire comes from the police and the children are not white. 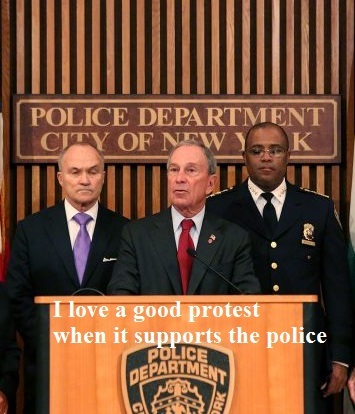 What unites the track record of the these mayors is not just the connection of two of them to Timmoney, police chief and protest smasher for hire, but the organization he was involved with alongside stop and frisk prophet Commissioner Bratton of New York. This organization, the Police Executive Research Forum (PERF), coordinated the 2011 nationwide crackdown on the Occupy Movement and later formed the balance of power in President Obama's Task Force on 21st Century Policing, which both sought to co-opt the Black Lives Matter Movement and push body cameras designed to increase surveillance. Protests are great for these people when they are paying for them, but when they are not, heads are going to be split open. The Homeland Security and National Security agenda is represented by both Mayor Nutter, who sits on Homeland Security Advisory Council, and retired Admiral Mike Mullin who is the former chair of the Joint Chiefs of Staff and of General Motors. There is a clear national security interest here with top tier people involved. The top tier brings us to lower tiers of the intelligence and national security apparatus, which is where we will find Jose E. Gonzalez, the father of protest leader and Douglass-Stoneman survivor Emma Gonzalez. The elder Gonzalez has made his career as a lawyer first for American Express, then Blockbuster, then Sunbeam, and then Telemark. At Telemark, his cyber-security lawyering skills could not save their contract with the Obama whitehouse after the repeated failure of the Healthcare.gov website. Gonzalez currently splits his time between DigitalEra and Trapezoid. Trapezoid is a cyber-security provider to the military and government and DigitalEra is an investors in such companies. Gonzalez sits on the board of both and is the CEO of Trapezoid. He joined the board of DigitalEra at the same time as James Cason, the former mayor of Coral Cables Florida. Prior to being mayor, Cason worked for 38 years as a Foreign Service Officer for the US State Department in 12 countries. He was posted as both Ambassador to Paraguay and Chief of Mission in Havana, Cuba. Combined with his academic background at John Hopkin's School of Advanced International Studies and the National Defense College, his resume screams CIA louder than a mass grave in Latin America. Trapezoid, where Gonzalez actually has a desk, is also backed by Covant, which “offers cloud computing, cyber security, and large scale data management solutions for intelligence communities, special operations, and department of defense. Covant Technologies serves customers in the United States.” That is business speak for big data services for black Ops. This is the hidden hand behind the Parkland Protest Puppets, and apparently Jose Gonzalez is perfectly happy to profit off his daughters trauma and desire to not be shot at school. The safety of children is not a priority for the people behind this movement however. Power and Control are and they are cynically using a tragedy and the fire of youth to advance towards these priorities.